Even since the battle at Antietam, the Lower Bridge has been called Burnside Bridge. "Go look at it and tell me if you don't think Burnside and his corps might have executed a hop, skip, and jump and landed on the other side. One thing is certain, they might have waded it that day without getting their waist belts wet in any place. Why Burnside's Bridge? It is sarcasm?" "The troops commenced crossing and a continuous stream of infantry and artillery poured over the bridge during the afternoon." By 3 p.m. Ninth Corps was ready. All except our second division were sent forward and attacked the enemy's right flank, which if done earlier in the day, when the enemy's left and center were engaged might have destroyed Lee's army." "Will You Give Us Our Whiskey?" Union Major General Ambrose Burnside's Ninth Corps was ready at 7 a.m. The order to attack came at 9 a.m.
One division spen the morning looking for the ford downstream. At the bridge the 11th Connecticut Regiment made the first attack. They were pinned down at the creek bank. 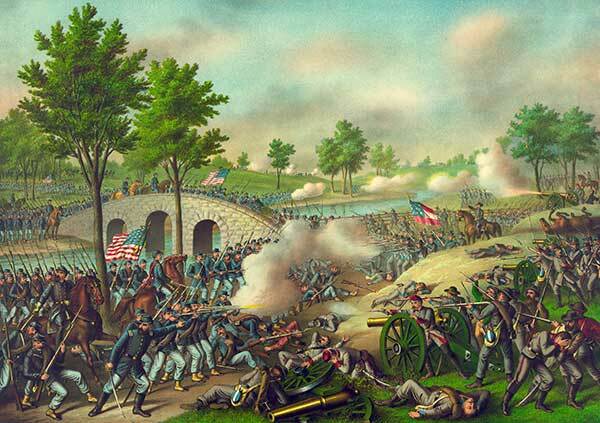 Three Ohio regiments got lost in the woods and came out 300 yards too far upstream. The 2nd Maryland, supported by the 6th New Hampshire, charged the bridge and sustained 44 percent casualties in 10 minutes. 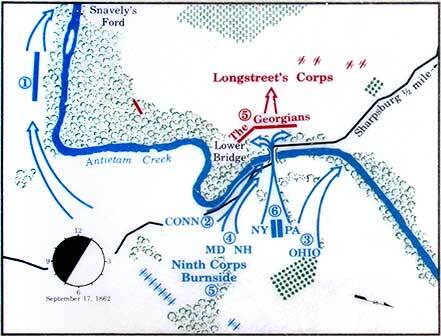 The entire Union Ninth Corps was held up by 500 Georgia and a few South Carolina riflemen looking down onto the bridge and creek. "It is General Burnside's special request that the two 51st's take that bridge. Will you do it?" "Will you give us our whiskey, Colonel, if we make it?" ..."charged up the road in column with fixed bayonets, and in scarcely more time than it takes to tell it the bridge was passed."